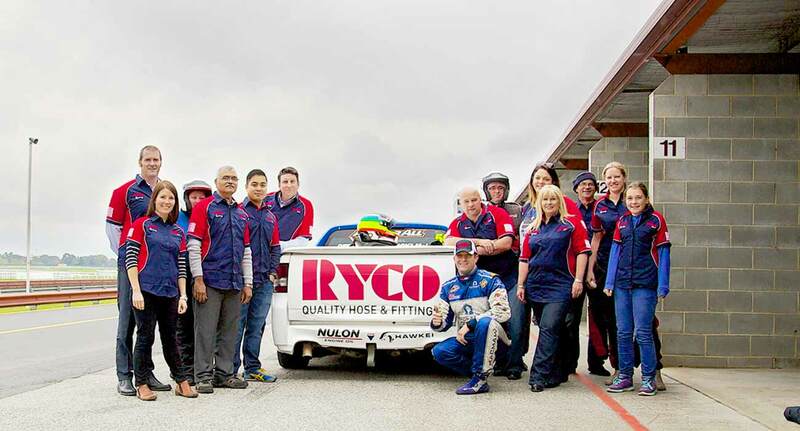 As a result of RYCO sponsoring Gerard “The Maverick” McLeod in five rounds of the Australian V8 Ute Racing Series, we were invited by Gerard to bring customers and staff to the Sandown race track to participate in some ‘Hot Laps’ in his V8 Ute. A draw was held among the interested Melbourne staff and those lucky enough to be selected were treated to two incredibly fast (and truth be told slightly scary) ‘Hot Laps’. With Gerard at the wheel, you needed to put a lot of trust in his driving skills. As the first corner on the race track comes racing towards you, the feeling of relief as Gerard touches the brake pedal quickly disappears as he instead accelerates into the corner and you start to question his sanity and your own mortality. From this point on, and for the rest of your time in the passenger seat, you are in his very capable hands and it can be said that the adrenalin rush only gets better when he clicks the Ute into top gear at 195 kph down the back straight. Needless to say after every ‘Hot Lap’ session there were big smiles all round, and both RYCO customers and staff thoroughly enjoyed the day. Please join us in wishing Gerard every success for the next three rounds of the V8 Ute Racing series.